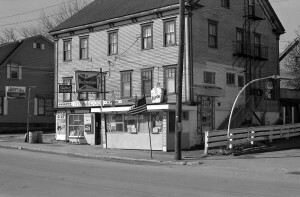 We admit this is a very poor photo but for those who remember Frank and Randy’s fish and chips it will bring back mouth watering memories. 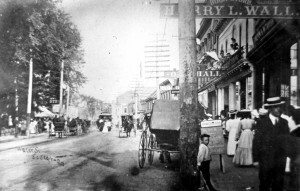 The restaurant was on Water Street in St Stephen and as we recall across from the “Wall” at the bottom of Memorial Park and War Memorial. The restaurant was not far from the bridge and on the way to the movie theater for the hundreds of kids from Calais who crossed the bridge every weekend to attend a movie. Hot dogs were a dime and fish and chips 35 cents. 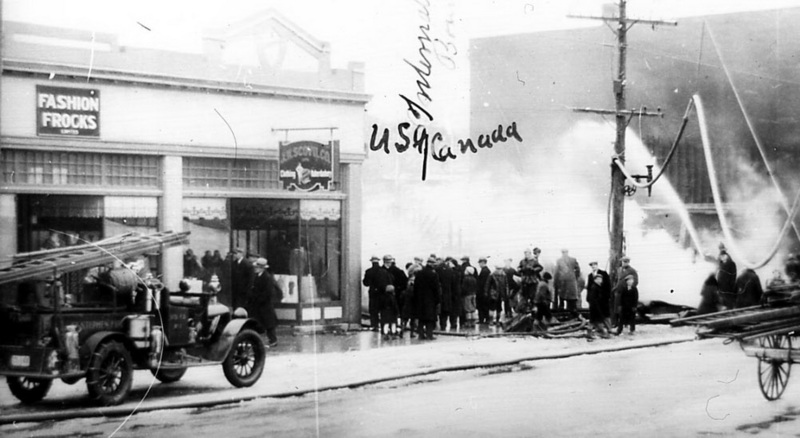 Movies were a quarter although there was a time when the Canadian dollars was very dear and admission was 27 cents American. 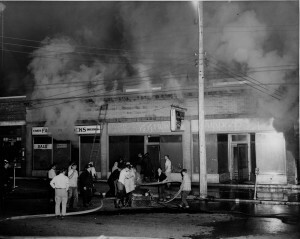 Frank was Frank Woodard, a former lumber camp cook who teamed up with Randy Burns, brother to Barry Burns of Andrews Tobacco fame, to open the place. 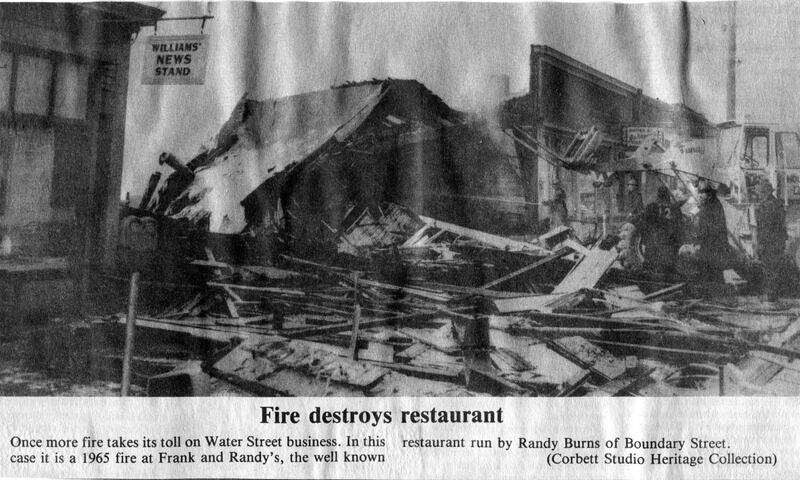 Unfortunately Frank and Randy were were far too busy to worry about grease buildup on its wall, floors, tables or, for that matter the food, and while this may have contributed somewhat to the devastation but it also added a good deal to the quality of the cuisine. 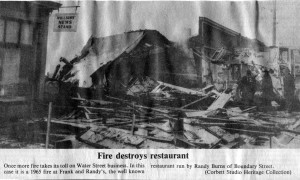 After the fire Randy brought his talents to Calais and teamed up with Barry in the dairy bar and hot dog stand at Andrews Tobacco Stand. 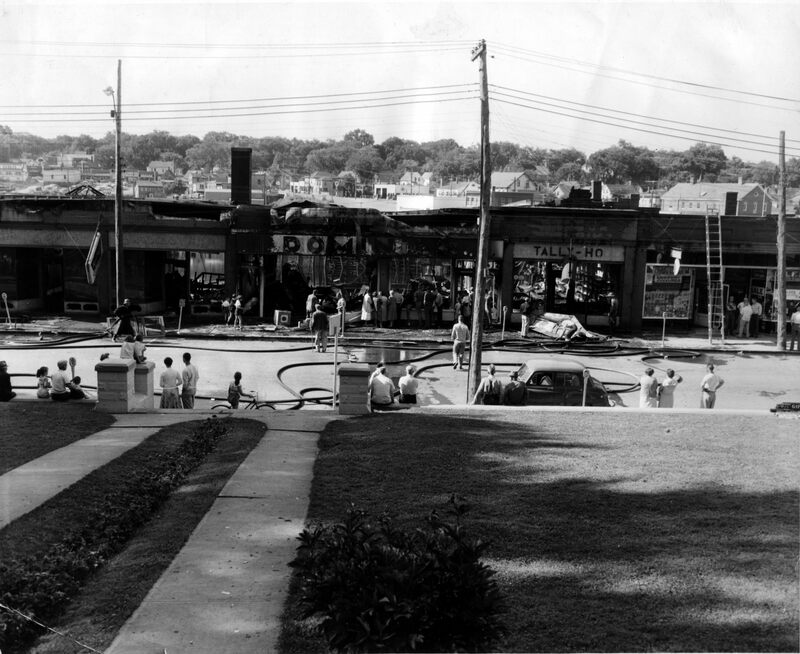 Barry and Randy Burns’ sister Molly Hogue also worked in the hot dog stand until it closed in the 1980’s. 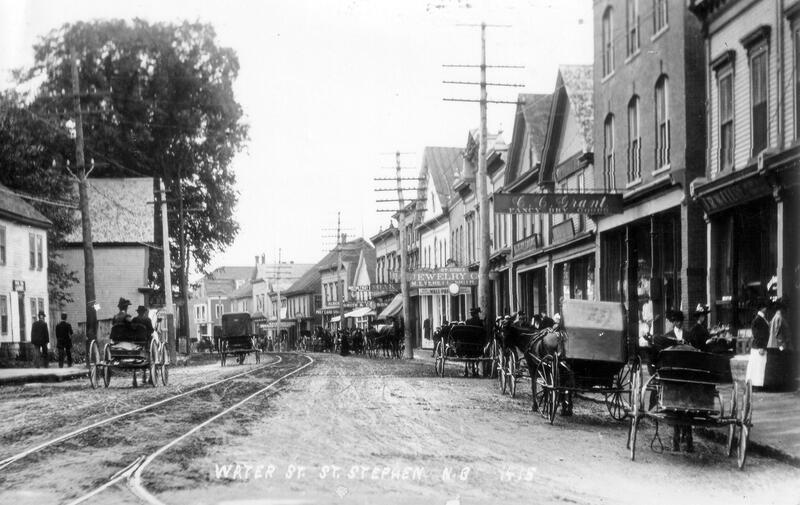 During St Stephen’s heyday as a commercial center the section of Water Street where Frank and Randy’s was located was home to many very upscale shops including Grant’s Fancy Dry Goods, St Croix Jewelers, Todd’s Furriers and several nice clothing stores. Oak Hall a merchant tailor and Harry Wall’s Book Store were successful businesses on the block. This photo was taken after 1895 as streetcar were not introduced until then and one can be seen approaching in the distance. Unfortunately the Frank and Randy’s fire of 1965 was not an unusual occurrence on this section of Water Street. 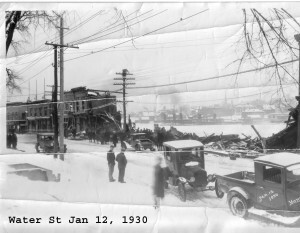 This 1930’s blaze destroyed several buildings just down the street. Calais can be seen across the river. 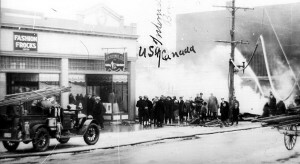 and Fashion Frocks and Agnew’s Shoe were also destroyed by fire. 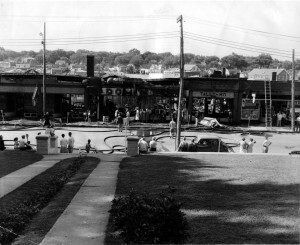 Finally we have this photo of another fire in the block at the Dominion Store and Tally Ho which is directly across from the Memorial Park on Water Street. In recent years Frank and Randy’s section of Water Street had fallen on hard times with several empty storefronts but this seems to have changed recently and many of the buildings which replaced those lost to fires are showing signs of life as is Water Street generally.